The Prime Minister has accused Labor of declaring a “war on the weekend” with its plan for half of all new cars to be electric by 2030, arguing it is unrealistic, out of touch and expensive. But the strident attack on the brink of an election campaign masks the fact the Coalition has championed electric cars for years, and has been providing concessional loans to help get more on our roads. Criticism of the 50 per cent target is also at odds with evidence from public servants, who have told estimates the Coalition has assessed its own target of between 25 and 50 per cent. “What Australians have always expressed a preference for is the vehicles that have a bit of grunt and a bit of power, because they like to enjoy the great recreational opportunities that are out there,” Prime Minister Scott Morrison said. Government figures show consumer preferences are changing quickly, despite electric vehicles still representing a very small portion of overall car sales. The Government’s Renewable Energy Agency (ARENA) reported 2,284 electric vehicle sales in 2017, which is a 67 per cent increase from the previous year. The number of electric vehicles for sale increased by 44 per cent during that same period. Modelling undertaken for ARENA and the Clean Energy Finance Corporation found that even if the Government doesn’t intervene in the market, electric cars would account for 29 per cent of new sales by 2030. The modelling shows a “moderate intervention”, through tax benefits and emissions standards, would see a 49 per cent share by 2030. Environment Department official Kristin Tilley told Estimates on Friday that those forecasts would be realistic under the Coalition’s Climate Solutions Package. Before Josh Frydenberg became Treasurer, he heralded an electric car revolution was coming to Australia and that current projections would see a million electric vehicles on our roads by 2030. Dr Anna Mortimer from Griffith University said the Labor’s Party’s 50 per cent target was the same as that introduced by the UK Conservative Government, while the Netherlands has set a target of zero emissions from cars by 2030. “The target will naturally be considered to be ambitious when no target has ever been considered, announced, projected by the Australian Government,” Dr Mortimer said. Mr Morrison has also accused Labor of taking choice away from Australian consumers, despite Labor’s policy not banning petrol, diesel or gas vehicles. How long does it take to charge a car? 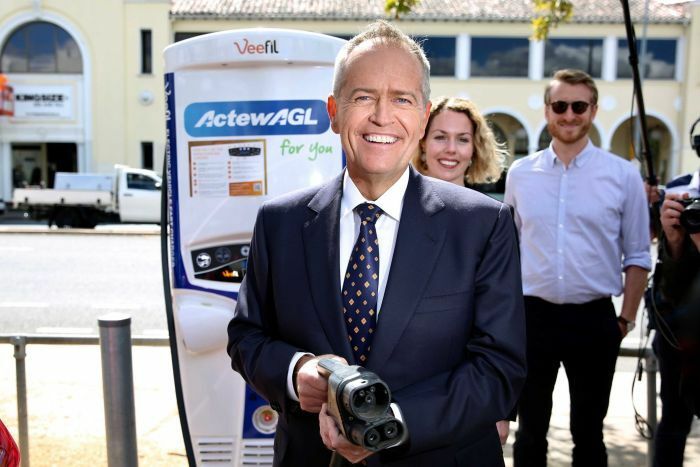 Mr Morrison and Energy Minister Angus Taylor were quick to ridicule Mr Shorten for saying it took six-to-eight minutes to charge a car. “If he can’t explain it and he can’t understand the details, how can he expect anyone else to?” Mr Morrison asked. At the moment, most industry guides say it takes hours to charge a car but the technology is rapidly improving. Hyundai believes its first all-electric SUV can reach 80 per cent charge in 54 minutes. Hussein Dia, the chair of civil engineering at Swinburne University, said a number of car manufacturers were investing in ultra-fast charging stations that would dramatically slash charging times. “Most need hours, but there are claims by manufactures who are developing fast charging stations that new tech can charge 80 per cent of the battery in 15-30 minutes,” Professor Dia said. In December, a German prototype led by BMW and Porsche gave an electric vehicle enough battery life to travel its first 100 kilometres in three minutes, although this technology is not yet available to market. Dr Mortimer said these investments from car companies would eventually improve the value of electric cars. “Being able to recharge cars within the recommended driving break time is expected to be a game changer for market uptake as it should help to address drivers’ remaining range anxiety,” she said.